DPMS Acquired By Cerberus. Joins Bushmaster and Remington. Cerberus Capital Management, a large holding company, has acquired yet another gun maker, this time AR-platform builder DPMS Panther Arms. In the past year, Cerberus has purchased three gun manufacturers: Bushmaster Firearms, Remington Arms, and Cobb Manufacturing. It looks like Cerberus intends to be a major player in the semi-auto AR-platform market, Colt and FN Mfg. LLC notwithstanding. Strategically, the DPMS acquisition places Cerberus in an even stronger position to pursue military rifle contracts–the prize we believed Cerberus was chasing all along. Randy Luth, DPMS founder and President, remarked, “We were looking for a partner that could enhance our expertise in operations and further develop our sales and marketing capabilities. Cerberus is a partner that can help us in those areas and provide the financial and operational resources required to expand our business. As we look forward, we see increased interest in our new calibers, based on the proven DPMS ‘LR’ rifle platform.” Based in St. Cloud, Minnesota, DPMS manufactures and distributes a complete line of AR15-based rifles and components, as well as rifle platforms in other calibers. The Cerberus press release says, “Mr. Luth will remain President of the newly formed DPMS Firearms, LLC and will continue to oversee the strategic and operational aspects of DPMS.” We’ll see… after Cerberus bought Remington Arms, there was a high-level shakeup and Bushmaster honchos replaced many Remington top execs. One positive aspect to Cerberus’ involvement in the gun industry is that the huge political clout Cerberus commands as the “rescuer” of Chrysler Corp. (which Cerberus also acquired) should undermine efforts to ban AR-platform rifles if the Democrats score big in the 2008 elections. Cerberus is big enough to make waves in Washington. Money talks in politics and Cerberus has lots of it. Share the post "DPMS Acquired By Cerberus. Joins Bushmaster and Remington." Here’s a good deal from Cabela’s, a 1-Day-Only special promotion. 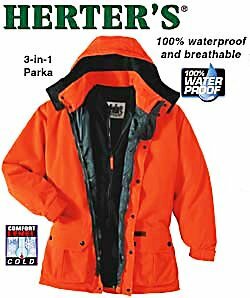 Herter’s FowlTech Blaze 3-in-1 Parka is on sale, today only, for $49.95–that’s $50 off normal retail. This parka has nice features for hunting–the warp-knit shell is quiet and soft, yet waterproof and breathable. And the shell has a low nap so it won’t pick up vegetation. The 3-in-1 Parka features a zip-out, heavy-weight 400-gram fleece liner jacket, zip front with storm flap, two large button-closed cargo pockets, detachable hood, and even a loop for your deer tag. We’d say this is a great deal for $49.95, while it lasts. You should read the User Reviews. Purchasers of this coat gave it very high marks. They say it is rugged, but still very stealthy and quiet–an important factor for hunters. Buyers liked the zip-up collar and many handy pockets. CLICK HERE for Cabela’s home page, then click the link for “One Shot Deals”. The Parka is the first item listed today. Share the post "Blaze Hunting Parka 1-Day Sale"